This is no ordinary tree trunk. It was a hot afternoon during my freshman year and I was trying to find my botany professor's office. Sweat running down my spine, already late for organic chemistry, lost in the basement of the Botany building. 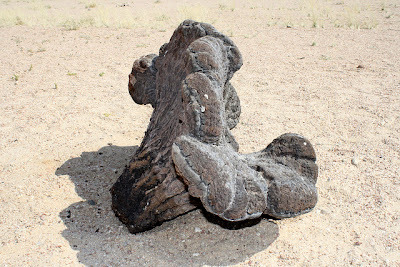 I turned a corner and came face-to-face with the giant, scalloped remains of a welwitschia, mounted on a pedestal. Clutching the ethnobotany paper I was meant to submit that day, I just stood there, enraptured, mesmerized. It resembled something creepily organic, like Martian fungus, or at least something indecent that had sprouted from the sea floor. Certainly not a tree trunk. I never made it to organic chemistry that day. 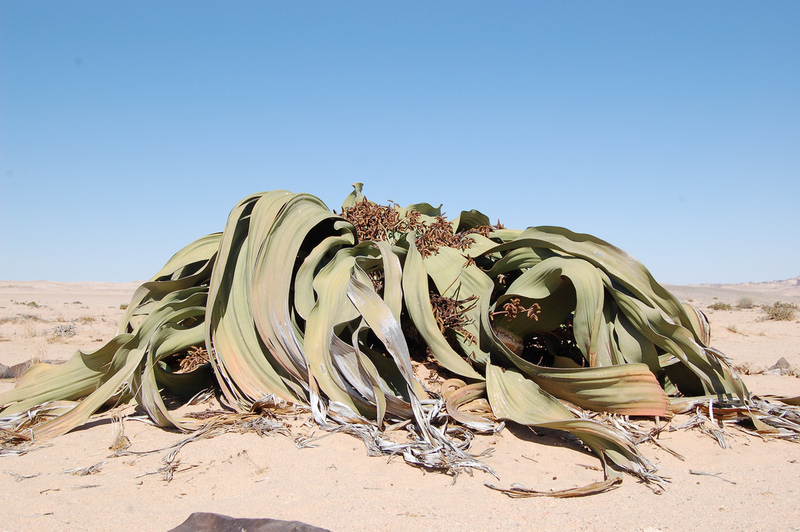 Welwitschia mirabilis makes the scorching Namib desert its home. Not only is Welwitschia mirabilis the solitary member of its genus, but it is also the only member of its family, the Welwitschiaceae. In fact, it is taxonomically so bizarre and so unique that it has been given its own order. The only other species that appear to be (quite distant) kin are the joint-pines of genus Ephedra. Wait, did I say joint-pine?! Yes, I did. For the welwitschia is a short, stunted gymnosperm and bears its seeds in cones, just like pines, firs and spruces. Think about that for a while. This weird tree is found only in the Namib desert of Namibia and Angola, a habitat as different from a dark northern forest as any, the oldest desert on the planet. It is estimated that welwitschias have been growing here for nearly 100 million years, and that they haven't changed much during that time. 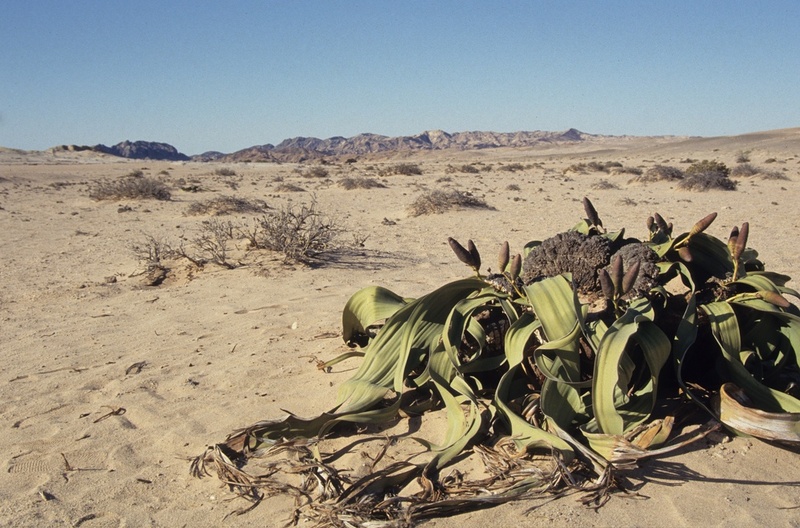 The welwitschia has many fascinating adaptations that allow it to thrive in this harsh climate. It survives in places where it sometimes doesn't rain for years, subsisting solely on the fog that rolls in from the Atlantic at dawn. Alien vegetable forms dot the landscape inside Messum Crater, Namibia. Its short woody stem is unbranched, but grows wider with age to form a crenulated woody bowl that can be a meter in diameter. Like most moisture-dependent desert plants, welwitschias are pretty slow-growing: it is estimated that large specimens with leaves in excess of 6 m long may be more than 1,500 years old. From the margins of the crested stem sprout what appear to be a myriad of strappy leaves. A large specimen in the Namib-Naukluft National Park. Their appearance is deceptive. In fact, the welwitschia only produces two opposing leaves that continue to grow throughout the life of the plant, becoming split and shredded through the action of sand and wind and centuries. The shredded leaves become a trap for wind-blown debris, enriching the sandy soil around the plant and providing shelter for insects, spiders and lizards. Welwitschias have a large taproot to pull moisture from deep underground, and also a network of short fibrous roots near the surface to help them absorb water from ocean fog that condenses on the leaves and rolls to the ground. In a way, these plants engineer their own microclimate to ensure their survival in extremely arid surroundings. 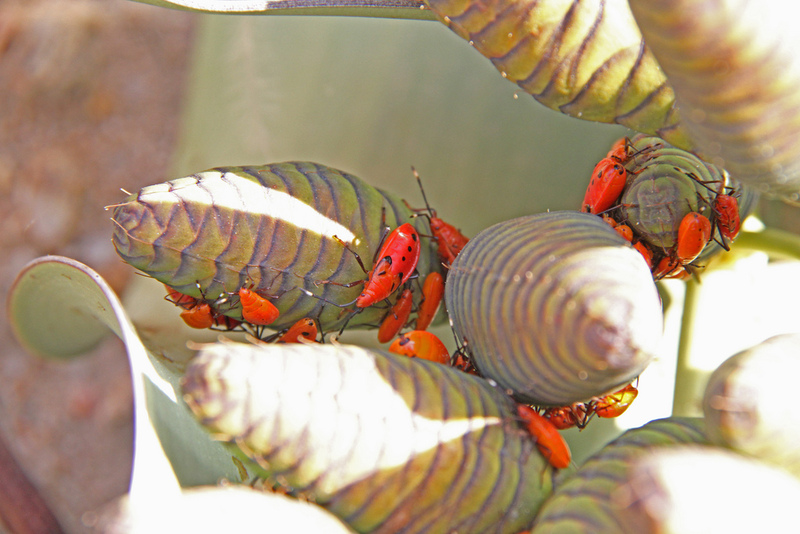 Welwitschia bugs on the cones of a female plant. As I mentioned, the reproductive structures of Welwitschias are cones, like those of cypresses and cycads. Male and female plants exist separately, bearing different types of cones. Male cones produce pollen, but not in copious amounts like those of wind-pollinated pine trees do. Instead, they rely on insect pollinators to carry their precious cargo to a receptive female plant. The plants are often found crawling with yellow or vermilion coloured welwitschia bugs, Probergrothius sexpunctatis, attracted by the sweet nectar secreted by the immature cones. However, these bugs don't seem to be the pollinators, and other insects have been suggested as the culprits, including flies and wasps. In the unforgiving desert, welwitschias have maximized their chances of survival, especially at the vulnerable seedling stage. When released from mature cones, welwitschia seeds may remain dormant in the sandy soil for several years until heavy rains come to the Namib. Only then does a new generation of Welwitschia mirabilis germinate. All in unison. Shortly after being introduced to gardening and plants I stumbled upon a post on these welwitschia and I've been on a wierd plant kick ever since. These things are incredible and are some of the wierdest things I've ever seen. You occasionally come across them at botanical gardens, or so it seems as I've read on other peoples blogs, I've yet to see one in person myself. What a great post, I learnt a couple new things. Those bugs are so strange! I'd love to see a Welwitschia sprout, someday. Youthful ancient promise. Never thought that a desert can have such an ancient plant surviving for decades. I guess these are not cultivated as houseplants - if they do, I'm certain that these can do without anything & they won't die easily.